Paper napkins just aren't for wiping your mouth and hands while eating . . . they make beautiful flowers, too! While it might be a bit costly to decorate your home with fresh flowers, or give each guest a real flower at their place setting, flowers made from paper napkins can look just as nice, and at a fraction of the cost - especially if you get the napkins from the dollar store. And the best part, you can make them to match your décor or party theme. The possibilities are practically endless using a few folding techniques, scissors, floral wire, tape, tacky glue and an assortment of colorful or printed paper napkins! To begin, starting at the corner of the paper napkin, carefully pull apart each ply, and then refold into original squares, following the folded lines. Next, fold into a triangle . . .
then another triangle . . .
and finally, one more triangle. Next, take the folded side and fold over, three quarters of the way. Using scissors, cut a round ice cream cone shape just below the edge. Next, open cut shape . . .
and holding the round area with one hand, twist one side of the top like you're screwing on something, tightly. Then holding the opposite side, twist again, as tight as you can . . .
Then, gently open the folded piece . . .
carefully keeping . . .
the twisted edges together. You can gently twist any edges that might have been separated when opening back together following the twist patterns. Repeat with more napkins, making as many layers for flower fullness and size. For the stem, group three floral stems together and cover with floral tape, starting at one end and coiling tape around stems until reaching end and securing tape. 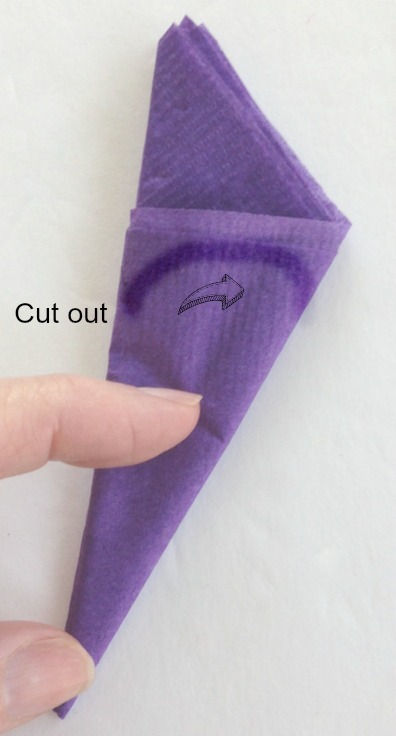 Then, make a hole in center of paper napkin and insert stem, stopping about 1.5 inches from top. Add tacky glue to stem edge . . .
and grasp bottom of napkin around stem, forming flower layer. Repeat for each layer of flower, adding tacky glue to base of previous layer. Continue adding layers for flower fullness . . .
until satisfied with fullness and look. Have fun making these adorable paper napkin flowers! They have the look of carnations with their twisted edges! Those are gorgeous, Gail! Love the two-toned purple one...my daughter is making flowers for her wedding. I'm going to forward this to her. Wow Gail, your paper flowers are so pretty! Thanks for sharing this tutorial with us at C&C with J&J. Enjoy the week. Paper flowers <3 its spring time! These are precious! These paper flowers are so lovely and fun to make. Thank you for sharing at Dishing it and Digging it link party. We love having you. These are so pretty! I love a simple and inexpensive project. Thank you for sharing with us at Celebrate Your Story, and I hope you’re having a great weekend. I like the others would not of imagined you could create these flowers, they are beautiful!!! Thank you for sharing on the #OMHGFF this week!! Enjoy the week. Gail these are so pretty. Thanks for sharing on Sunday's Best. I love your creativity. Have a great week-end. Gail, I think someone could show you a pile of trash and you'd be able to turn it into something beautifully creative! You never fail to impress. These twisted paper napkin flowers are so pretty! Just gorgeous Gail. And the purple shades make it look so full and abundant. Gail, you are amazing!! Honestly, love your crafts, over and above the rest. Beautiful!! Have a great week. Linda @Crafts a la mode.